The arrival of the RRS James Cook into Rio kicked off a special day of events hosted by the city’s Museum of Tomorrow to celebrate the announcement of the upcoming UK-Brazil Year of Science and Innovation. On the 27 February, after docking for the first time ever in Praça Mauá, Rio, representatives from the NOC, including ship’s Captain, John Leask and Executive Director Prof Ed Hill OBE, welcomed visitors from the Museum and groups of local school children on board the RRS James Cook for tours. This was a unique chance for them to see first-hand the novel technology used in ocean research and meet some of the crew, which for the upcoming expedition includes scientists and engineers from 11 different nationalities across nine institutions, including the University of São Paulo and the Instituto de Estudos do Mar Almirante Paulo Morreira. 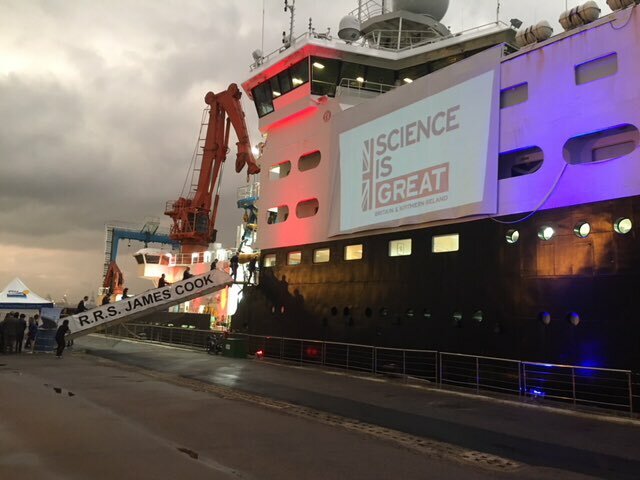 Ed Hill said “ I am delighted that the visit of RRS James Cook to Rio de Janeiro - almost exactly 250 years after British explorer James Cook called at Rio on his first voyage of discovery - has paved the way for the launch of the UK-Brazil Year of Science and Innovation. On leaving Rio the ship will take six weeks crossing the Atlantic to Namibia and then South Africa stopping 150 times along the way to sample the ocean with precision measurements up to 6km deep including for temperature, dissolved oxygen, dissolved carbon and micro-plastics. The expedition is part of the Global Ocean Observing System’s GO-SHIP Programme. The scientific team, which includes researchers from the UK, Brazil, Namibia and eight other countries reflects the truly international nature of global scale oceanographic sciences." During the Museum event the Ambassador made the official announcement that the UK-Brazil Year of Science and Innovation will be formally launched alongside its schedule in April. The initiative promises to be a grand cooperative celebration in the science community, with a schedule of events, lectures and opportunities for research funding for collaborative projects between the two countries. “Science collaboration between the UK and Brazil is enormous, has major impact on our lives, and even greater potential for the future. The highlights of this Year include lectures across Brazil, with British Nobel laureates, scientific workshops and seminars to discuss innovation. There will also be a round of funding for research through the Newton Fund”, promises the British Ambassador. “This will be an opportunity for scientists, entrepreneurs and British and Brazilian companies to celebrate what our joint research has already accomplished – from sequencing the Zika virus to advanced agriculture - and discuss how to work together on future global challenges such as health, climate change, energy, biodiversity and agriculture”, says Rangarajan.